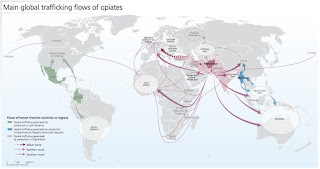 In June 2015, the United Nations Organization on Drugs and Crime (UNODC) published its Drug Annual Report outlining the recent development of the new Southern Route for trafficking opium, which signals the substantial deviation of the traffic of Afghan opiates. 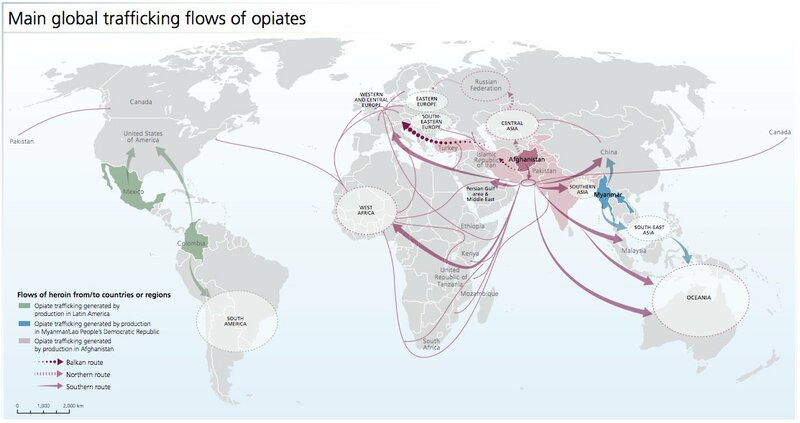 The well established Baltic Route (Afghanistan, Iran, Turkey and then the Baltic region) that served as the commercial highway to the European opiate market has succumbed to the international geopolitical situation in the Middle East so that the growing threat of terrorism has affected even the illicit drug trafficking system. This new route starting from Afghanistan reaches Pakistan and then proceeds by two routes to enter Central and North Africa before serving as a bridge to Europe and the US. 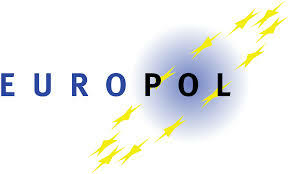 • through the South, by sea, to Kenya and Tanzania to the Republic of Congo, Chad and Nigeria ending in West Africa.